What if you had the ability to schedule non-emergent, on demand transportation for your patients? What if you could have more transparency, and provide increased safety with better wait times to and from appointments? Relay Transportation, a web-based application augmented by One Call’s proprietary network and customer contact center, allows the end user to seamlessly schedule and review transportation while providing transparency and enhanced safety in an industry where there previously was none. With Transportation Network Companies (TNCs), drivers have control over the hours and locations they choose to work as well as the passengers they wish to pick up, mitigating the risk of violent crime in unsafe areas and late night hours. As added security for drivers, GPS tracking gives ridesharing companies the ability to track routes as well as provide drivers awareness of pick up and drop off locations. In addition to the driver application security features, TNCs themselves monitor passenger ratings and have the ability to remove user access. Smart technology via a passenger mobile application provides customers with an additional layer of safety. Before getting in, riders can confirm the vehicle make, model and license plate as well as the name and overall rating of the driver. The app also gives the ability to view routes in real time with GPS and share location with friends and family. This technology further enhances safety by keeping phone numbers confidential and randomly matching riders with drivers to ensure there is no discrimination. TNC drivers are strictly monitored, and the challenge to stay compliant is widely known in the ridesharing community. Stringent credentialing requirements must be verified before they are able to get on the road. By contrast, there is no single standard or set of requirements to become a taxi driver; the criteria are inconsistent and vary by state and city of residence. TNCs require their drivers to complete an annual vehicle inspection at pre-approved auto shops or activation centers. TNCs also empower passengers to rate their drivers and vehicles after every ride. TNCs use this continuous feedback to monitor and subsequently suspend or deactivate a driver if their vehicle or experience is not up to par. If a driver receives a rating of three stars or less by a passenger, they will never be matched up again and vice-versa. To put passenger’s mind at ease even further, TNCs have adapted liability policies that cover driver incidents and in combination with One Call’s own liability coverage, patients have more protection in the event of an accident. The safety precautions provided by TNCs more than speak for themselves. With over 38,200 rides completed for approximately 11,000 patients in its infancy, Relay Transportation is quickly becoming the preferred method for non-emergent transportation in the healthcare industry. This article was published in Property Casualty 360. Access the full article here. One Call is the nation’s leading provider of specialized solutions to the workers’ compensation industry and is headquartered in Jacksonville, Florida. 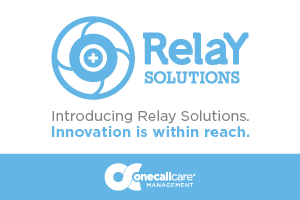 One Call’s solutions enable faster, more efficient, and more cost-effective claims resolution with a focus on injured workers’ needs across the continuum of care. For more information, visit www.onecallcm.com. This is a sponsored post from WorkCompWire marketing partner One Call Care Management.